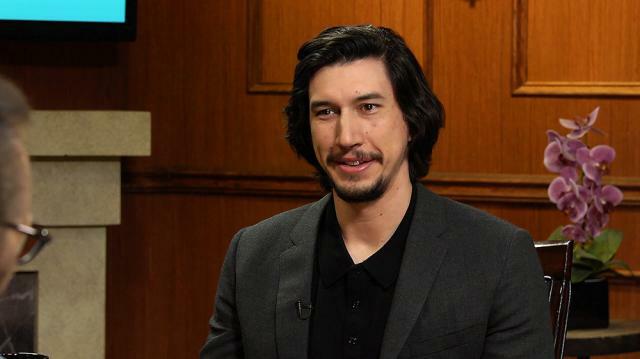 Adam Driver provides Larry with a snippet of what fans can expect in 2017's highly anticipated 'Star Wars: Episode VIII,' which he, of course, stars in as the villain Kylo Ren. Larry King: @halfpastpodcast: Without giving away any spoilers, what’s one aspect about Kylo Ren you’re excited for fans to see in the next film? Ah good questions. You’re not revealing anything, but an aspect. Adam Driver: I think, I mean this is such a general answer, but you know, humanity. Even though it’s very much a Blockbuster movie, and I’m aware of that, there was not taking that for granted in that we were forced to be general. You know, there were a lot of plot points that we knew were operating in the first one that we get to explain more in the second one that kind of make the both of them make sense. But they do kind of feel kind of socially active to me. In that they’re – this is a long answer, but George Lucas originally – you know a lot of Star Wars was in response to Vietnam and I think a lot of what the, I remember talking to JJ and Ryan with this idea of terrorism and two sides kind of being mortally justified to behave however they wanted to to get what they thought was absolutely correct. Larry King: Who directs the next one? Adam Driver: Ryan Johnson just directed this one.